With only five points covering the three rider Spanish riders all still in contention for the Moto3 crown, the opening race at Valencia was always set up to be a tense and dramatic affair and did not disappoint. A group of five riders made a break at the front with Luis Salom, Alex Rins, Maverick Vinales, Jack Miller and Jonas Folger all in the hunt for the win, with victory securing the championship too should the race go Salom, Rins or Vinales way. The first to fall was Jack Miller, with Salom falling just a few laps later, putting an end to the Red Bull KTM Ajo riders title hopes. The leading trio of Vinales, Rins and Folger were well clear of the pack, leaving them to sort out the podium places amongst themselves. After looking well out of contention before the events of Japan the race then went like a dream for Vinales, the Team Calvo rider taking just his third win after powering past Rins in the final corner, and his first victory since Le Mans in May. Behind him Rins was also to be pipped by Folger, starting a great run of results for Aspar at their home track. The Estrella Galicia rider was gracious in defeat, clapping his rival after crossing the line while Salom, who rejoined to finish 14th, was also quick to seek out Vinales and offer his congratulations. 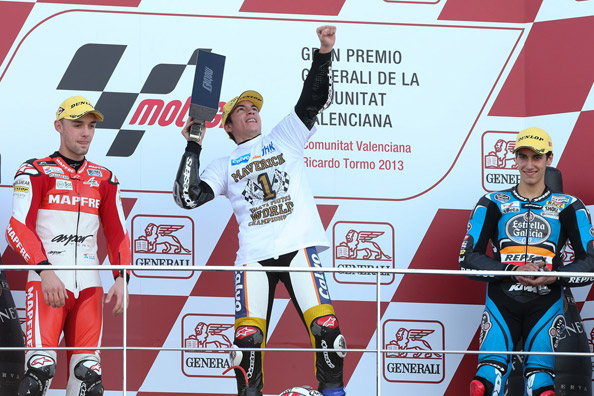 Top rookie Alex Marquez was next to cross the stripe in fourth. Efren Vazquez took fifth for Mahindra ahead of the top Honda rider Alexis Masbou in sixth. Isaac Vinales, cousin to Maverick, finished seventh. Team Calvo’s Ana Carrasco was eighth after a race long battle with Masbou, her best finish of the season. Philipp Oettl also continued his strong end of season run with a ninth ahead of Miguel Oliveira who just made the top ten after a crash left him down in 17th on the grid after qualifying. Also in the points were Romano Fenati in 11th for San Carlo Team Italia, Ambrogio’s Brad Binder in 12th, Red Bull Rider Zulfahmi Khairuddin in 13thwhile Matteo Ferrari secured the final point. Brit John McPhee crashed out but returns for his Caretta Technology-RTG team next season. Though the title was decided Moto2 had no intention of being a quiet affair. Champion Pol Espargaro had dominated leading up to the race and that form continued over the opening laps as he moved out over 1.5 seconds ahead of Nico Terol and pulling away. The Pons riders hopes of going out on a winning high were dashed when he crashed into the gravel with 19 laps remaining, recovering his bike to circle for the fans and place 29th. Nico Terol then took over the duties of storming away at the front but did not falter handing Aspar a win at their home track with his third victory of the season having also taken the spoils in Austin and Aragon. Aspar then saw the finish become a 1-2 for the team as Jordi Torres moved into second, passing Simone Corsi despite having a painful hole in his foot sustained in his Japan crash. A photo finish then robbed NGM’s Corsi of a podium finish, with Johann Zarco then being moved ahead of him to the third rostrum position. Fifth went to Tito Rabat, though that was not enough to elevate him any higher in the championship standings, satying third to runner-up Scott Redding. Alex De Angelis was sixth for Forward racing, ahead of Tom Luthi in seventh after his tyre choice left him struggling. Ant West surged through the field for eighth, Mattia Pasini ninth and Dominique Aegerter continued his amazing sting of points finishes, now at 33, by finishing in tenth. The Italtrans bikes of Julian Simon and Taka Nakagami were 11th and 13th respectively, with Xavier Simeon splitting the pair in 12th. The remaining points went to the Marc VDS team, Mika Kallio took 14th as Scott Redding rode through the pain barrier to take the final point despite adding a lost tooth to his list of injuries over the weekend. Gino Rea rode a strong race as a wild-card rider, just missing out on points in a tight race in 19thth. Next Next post: Marc Marquez – MotoGP World Champion, Record Breaker and just 20 years old.